Ketchikan, Alaska - Saturday, October 14th, was a dark, wet, rainy day, but that didn't stop a handful of Ketchikan residents joining the SAGA (Southeast Alaska Guidance Association) crew at Settlers Cove. SAGA has been on Revillagigedo Island for the past two months, working on various projects on public lands in the Ketchikan area. 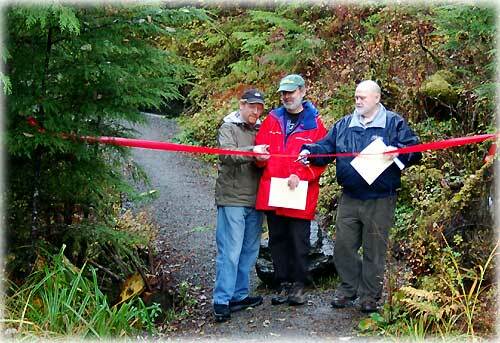 Ketchikan City Mayor Bob Weinstein and Rep. Jim Elkins cut the ribbon opening up 207 acres added to Settlers Cove. The five area volunteers joined the crew at 10.30 am at the SAGA tent base at Settlers Cove, and after filling out the required waivers, volunteers were each given a rake or a wheelbarrow, and joined the rest of the crew to help spread gravel over all the trails connecting the campsites at Settlers Cove. With Ryan Sotomayor from SAGA coordinating the raking crew, and five others manning the wheelbarrows, it required only a little over an hour to have all the holes filled and leveled and having the trails look like new once more. Pleased with the results, the work group gratefully headed for the base tent to get out of the rain and warm up for a bit with a lunch of chili, crackers, chips, and "goobers" The latter was a delicious combination of granola and chocolate. Stories were shared about home areas, as well as other places that the SAGA crew had worked on this summer - Skagway, Girdwood, and Juneau among others - working up new trails, and upgrading older ones, as well as other needed improvements on public lands in southeast Alaska. After lunch, some of the group headed up the nearby Lunch Creek Trail, and met with another group of other Ketchikan residents for a brief hike up the first half mile of the trail with a forest service guide who pointed out some of the local flora. Hurrying back to the trailhead, participants arrived just in time for the highlight of the day: the ribbon cutting ceremony for the 207 acres that have just been added to Settlers Cove, witnessed by those who had done the short hike, as well as about thirty other residents and officials. The land acquisition has been in the works for more than four years, requiring the cooperative effort of Alaska State Parks, the city of Ketchikan, Gateway Borough, and the University of Alaska, who were the owners of the property. They were assisted in this by the Conservation Fund which is a nonprofit organization dedicated to protecting our most important landscapes and waterways. 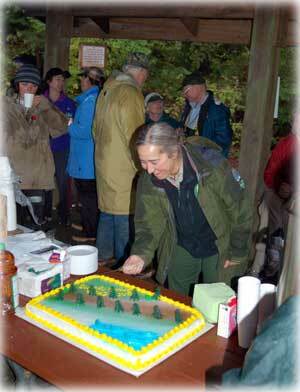 However, it was mainly through the work of Mary Kowalczyk, the Park Ranger at Ketchikan's State Parks, that the long sought-after acquisition has become reality. 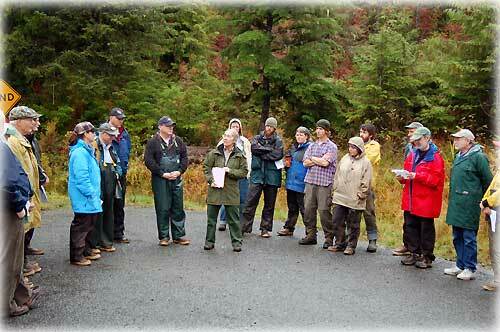 Representatives from each of the groups, as well as Ketchikan City Mayor Bob Weinstein and Jim Elkins, current representative in the State Legislature and a supporter of the acquisition, made brief speeches, and then the red ribbon was cut, officially joining the new land with the existing State Park. Guests and participants then headed down the brand new trail connecting Lunch Creek Trail to the Settlers Cove Nature Trails via the Waterfall Viewing Platform; a short 500 foot walk highlighted by a view of the waterfall. Awaiting at the shelter was warm coffee and a large cake especially made for the day, decorated by a forest of trees, and "clear-cut" by Park Ranger Mary Kowalczyk after demonstrating her best "chain saw technique" to the amusement of everybody. It was a great day, and a special, memorial occasion for Ketchikan and a day to celebrate the hard work and dedication of people who want to preserve this island for future generations.